The 26.39 metre motor yacht Justeni, jointly listed for sale by Dbeere Yachts and Sunseeker Nederlands is sold with Sunseeker Nederlands introducing the buyer. 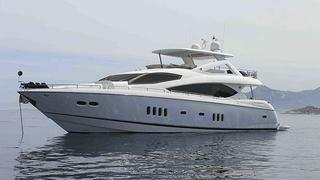 Built in GRP by UK yard Sunseeker International, she was delivered in 2008. *Justeni *accommodates up to 10 guests in four cabins consisting of a master suite, VIP suite and two twins, each with a Pullman berth, and all cabins have full en suite facilities. She is highly specified and has been professionally maintained since new. Justeni has the added advantage of having the hydraulic Trac Star Digital Fin Stabiliser system which provides full roll control at speeds above 13 knots as well as significant roll reduction while at rest or anchor. The interior is beautifully finished with satin cherry cabinetry and cream carpets along with leather soft furniture, thus providing a very warm and elegant feel. Justeni is fully MCA Coded and her flybridge is fitted with an opening hard top, making this area an excellent spot for al fresco entertaining and dining. She boasts an extensive list of additional equipment and has recently been fitted with new exterior upholstery. She is powered by twin 1,800hp Caterpillar engines giving her a cruising speed of 24 knots and top speed of 29 knots. Lying in France, Justeni was asking €1,850,000.